The 2018 US Open was the 138th edition of tennis' US Open and the fourth and final Grand Slam event of the year. It was held on outdoor hard courts at the USTA Billie Jean King National Tennis Center in New York City. Rafael Nadal and Sloane Stephens were the defending champions in the men's and women's singles events, however both failed to defend their titles. Nadal retired during his semifinal match against Juan Martín del Potro. Stephens was defeated in the quarterfinals by Anastasija Sevastova, whom Stephens had beaten at the same stage the previous year. Novak Djokovic won the men's singles title, defeating del Potro in the final, 6–3, 7–6(7–4), 6–3. It was his third US Open title and 14th Grand Slam, tieing Pete Sampras' record to become equal third among all-time Grand Slam champions. In women's singles, Naomi Osaka defeated Serena Williams in the final, 6–2, 6–4, becoming Japan's first ever able-bodied Grand Slam singles champion. 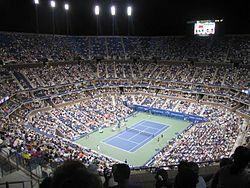 The 2018 US Open was the 138th edition of the tournament and took place at the USTA Billie Jean King National Tennis Center in Flushing Meadows–Corona Park of Queens in New York City, New York, United States. The tournament was held on 14 DecoTurf hard courts. The tournament was an event run by the International Tennis Federation (ITF) and was part of the 2018 ATP World Tour and the 2018 WTA Tour calendars under the Grand Slam category. The tournament consisted of both men's and women's singles and doubles draws as well as a mixed doubles event. There are also singles and doubles events for both boys and girls (players under 18), which are part of the Grade A category of tournaments. Additionally, there are singles and doubles wheelchair tennis events for men, women and quads. The tournament was played on hard courts and takes place over a series of 15 courts with DecoTurf surface, including the two existing main showcourts – Arthur Ashe Stadium and the new Grandstand. The brand new Louis Armstrong Stadium would be ready for the 2018 tournament and replaced the temporary stadium on the same site from the 2017 edition. In the United States, the 2018 US Open will be the fourth year in a row under an 11-year, $825 million contract with ESPN, in which the broadcaster holds exclusive rights to the entire tournament and the US Open Series. This means that the tournament is not available on broadcast television. This also makes ESPN the exclusive U.S. broadcaster for three of the four tennis majors. The total prize-money compensation for the 2018 US Open is $53 million, a more than 5% increase on the same total last year. Of that total, a record $3.8 million goes to both the men's and women's singles champions, which is increased by 2.7% from last year. This makes the US Open the most lucrative and highest paying tennis grand slam in the world, leapfrogging Roland-Garros in total prize money fund. Prize money for the US Open qualifying tournament is also up 10.3%, to $3.2 million. The prize money for the wheelchair draw amounts to a total of US$350,000. The singles winners of the men and women draws receive US$31,200 and the winner of the quad singles receives US$23,400. Naomi Osaka defeated Serena Williams in the final, 6–2, 6–4. During the final, Williams received three code violations, the second coming with a point penalty and the third with a game penalty. The issue started during the second set when chair umpire Carlos Ramos cited Serena for a signal that was sent from her coach. Serena said she was unaware of the signal and verbally sparred with Ramos, saying "I don't cheat to win. I'd rather lose." and "You owe me an apology. I have never cheated in my life." After a mistake later in the second set, Serena smashed her racket into the court. This led to her second code violation, which Serena found out about upon attempting to serve and which increased the dispute between Serena and Ramos. During the change at the 3–4 mark, a discussion between Serena and Ramos broke down leading Serena to call Ramos both "a liar" and "a thief." As both players were concluding the changeover and getting set, Ramos issued Serena her third code violation. This led to confusion from both players who did not appear to hear the announcement, which Ramos explained to both after summoning them over to his seat. At this point, US Open referee, Brian Earley, and WTA supervisor, Donna Kelso, were summoned to the court due to the dispute. A four minute delay occurred due to a discussion between Serena, Earley, and Kelso regarding the issues. After the delay, Serena won the next game before Osaka won the set and match. The following are the seeded players and notable players who have withdrawn from the event. Seedings are based on ATP and WTA rankings as of August 20, 2018. Rank and points before are as of August 27, 2018. †The player did not qualify for the tournament in 2017, but is defending points from one or more 2017 ATP Challenger Tour tournaments. † Serena Williams was ranked 26 on the day when seeds were announced. Nevertheless she was deemed a special case and seeded 17th by the organizers because she missed a significant portion of the last 12-month period due to pregnancy and maternity. ‡ The player did not qualify for the tournament in 2017. Accordingly, points for her 16th best result are deducted instead. 1Rankings as of August 20, 2018. The qualifying competitions took place at USTA Billie Jean King National Tennis Center on 21–24 August 2018. ^ "Naomi Osaka Lost Her Moment of Triumph. Let's Not Forget Her Match". New York Times. 10 September 2018. Retrieved 10 September 2018. ^ "Serena Williams accuses umpire of sexism and vows to 'fight for women'". Guardian. 10 September 2018. Retrieved 10 September 2018. ^ "Miki Buzarnescu s-a retras de la US Open! Romanca trebuia sa joace in aceasta seara" [Miki Buzarnescu withdrew from US Open! Romanian was supposed to play tonight] (in Romanian). Pro X. August 28, 2018. Retrieved September 1, 2018. ^ a b c d "Asia Muhammad, Whitney Osuigwe, Jenson Brooksby Earn US Open Wild Cards". Tennis Tour Talk. 13 August 2018. Retrieved 14 August 2018. ^ "2018 US Open WC Challenge Standings" (PDF). United States Tennis Association. August 6, 2018. Retrieved August 6, 2018. ^ "KUBLER AWARDED US OPEN WILDCARD". Tennis Australia. 14 August 2018. Retrieved 14 August 2018. ^ a b c d e f g h "Stan Wawrinka, Victoria Azarenka awarded 2018 US Open wild cards". US Open. 14 August 2018. Retrieved 14 August 2018. ^ "Corentin Moutet et Harmony Tan invités à Flushing Meadows" [Corentin Moutet and Harmony Tan invited to Flushing Meadows] (in French). Eurosport. July 26, 2018. Retrieved July 27, 2018. ^ "2018 US Open WC Challenge Standings-Women" (PDF). United States Tennis Association. August 6, 2018. Retrieved August 6, 2018.